“For I know the plans I have for you,” declares the Lord, “plans to prosper you and not to harm you, plans to give you hope and a future,”~Jeremiah 29:11. Have you ever been disappointed by God’s response to your problem or circumstances? If the answer is no, well, this post may not encourage you. If the answer is yes, then keep reading. God and I have a long history together. Much of our history was deepened during seasons of intense grief and suffering. No worries, I have no plans of rehashing my entire life story. I will share with you one that may encourage you to cling to the words of Jeremiah 29:11. My dad is a pastor, my mum was my Sunday school teacher. I grew up watching sick people recover by the power of prayer. I saw miracles. They were normal in our home and our church. There were times of supernatural provision and things that could never be explained away by luck or chance. We saw and were taught to expect God to do amazing things! I did not see the behind the scenes with my parents, meaning they never showed us any disappointment in God’s answers. My dad to this day does not complain. I had no grid for how to handle when God’s answers did not look like my prayers. The answer “God knows best” doesn’t make sense to a child or someone grieving or without a long history with God. Over the seasons of tremendous loss, I found peace in worship and the Psalms. David expressed his emotions to God unashamedly. I honor David. Probably why my book is a collection of Psalms, and verses to God. Some written in seasons of agony. I tell you these things because in this world we will face trouble. Jesus told us we would. The day I buried my mum was the worst day of my life, well one of them. I knew God healed. She was not healed here on earth. I write this post for her as her birthday is upcoming. Her funeral gathered people from all over the USA. It was so large we had to have in the high school auditorium. This woman who taught Sunday school in a small town had impacted so many people’s lives. She loved like Jesus. She acted like Jesus. She lived like Jesus. And everywhere we went she was loving people. They never forget her. Some gave their lives to Jesus once she was gone. I simply hoped God let her glimpse or know how many people she impacted for Him, for His Kingdom. Knowing her was something challenging to explain. She was unforgettable. She enlarged heaven even in her death. So, my encouragement to you is this: when God’s answer does not seem to match your prayers know God isn’t angry with you for being hurt, or disappointed. You can cry out to Him, and He will bring tremendous comfort. He will do such a work in your heart. He will provide for you in ways you’ve never imagined. He’s so good. He loves you. 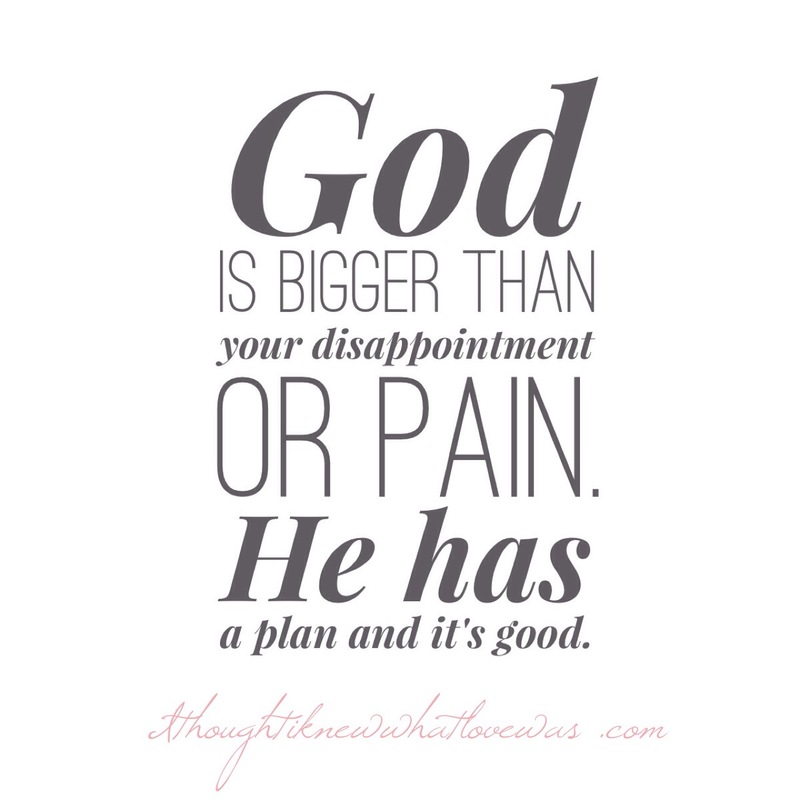 He has a plan and it’s good! God works all things together for eventual good. It doesn’t always feel good and may not be our definition of good. The evil one comes to steal, kill, and destroy. Jesus came so we could have life and have it to the fullest! God’s love and comfort are more powerful than our pain. God redeemed mankind and can redeem impossible situations. If the answer is no, we can still find joy and comfort in Him. God does heal! I’ve seen many more people healed in the years since she’s past. Healer is His name. So we don’t stop believing God is who He says He is. Every human being will leave this earth at some time. God knows when. This flesh is not immortal. We only have eternal life in Christ, in eternity. Jesus defeated our worst enemies on the cross. These momentary afflictions are nothing compared to the glory that awaits us!!! That last truth has gotten me through some pretty challenging seasons. If you suffer loss or disappointment, you will grieve. It’s normal and does not mean you have no faith. I hope and pray you are blessed beyond measure! My prayer is we run to God instead of away from Him when we are hurt, grieving, or disappointed. You are so deeply loved.